Heading to Chinese Harbor in a Santa Ana … blowing 30 knots here. Cavern Point just off port bow. We’re reefed to about 1/3 of our sail plan and moving at 7+. When the wind howled out of the east, we headed out. 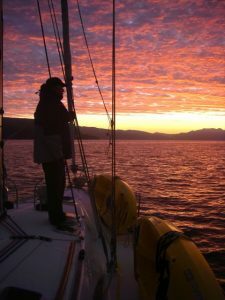 The usual five or six hours spent on a close reach to the best anchorages on Santa Cruz was suddenly cut in half as we screamed across the Santa Barbara Channel on a broad reach. 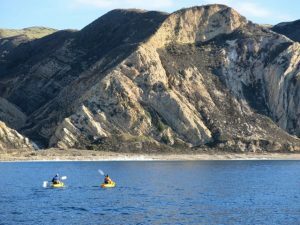 We had to “spring” out of our slip in Channel Islands Harbor to avoid getting set on the rocks, but once in the fairway it was a romp. That said, Santa Anas can be deadly, and we’re very leery of heading out when it’s blowing full blast. This one wasn’t even called a Santa Ana, but it was hot, dry and out of the east up with an occasional blast to 30 knots. Next question: Where do you go if you do go? Chinese harbor after the Santa Ana. 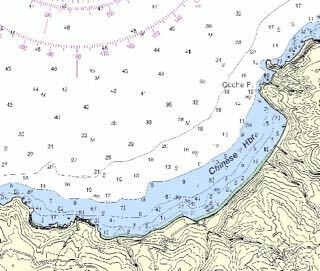 At the “Ventura End” of the island, there are two choices: Potato Harbor or Chinese Harbor. As many local sailors will tell you, Santa Anas are frequently followed by a dramatic 180 degree wind shift. We have seen it go from 30 knots out of the east to 30 out of the west in less than five minutes. 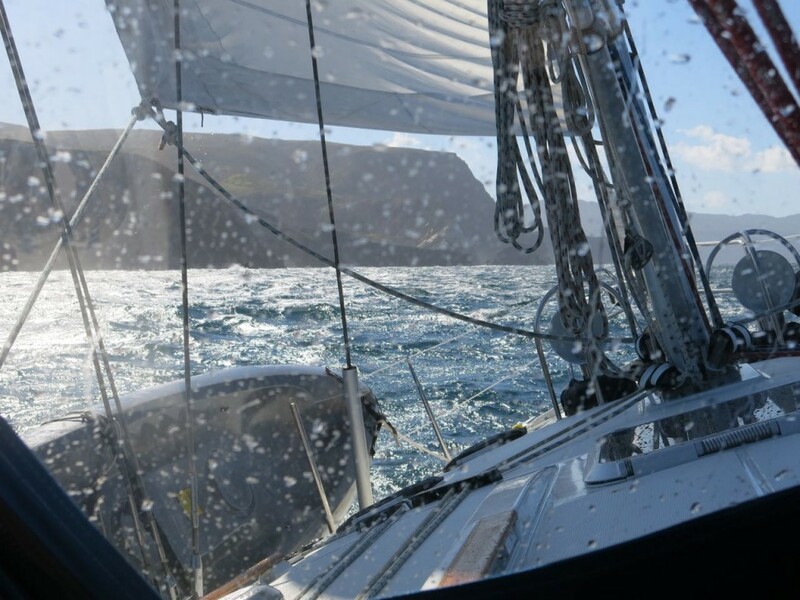 With 30 knots of west wind, I don’t want to be in Potato. I’d rather have the unrestricted exit provided in Chinese. This has got to be one of the easiest anchorages to find on the island. Once you’re near the NE end of Santa Cruz, locate Cavern Point. If your approach is from the east, you’ll put Cavern point on your left and cruise one of the most spectacular stretches of the island. Standoff a half mile or so and follow the coast to Coche Point. China Bay will open to your left, the wind will abate and you will have found paradise. Coming from the west is a bit less spectacular. Find Pelican Bay — Chinese is due east at 4.5nm. Its sheer yellow cliffs are easy to spot at more than 10 miles. We elected to anchor a bit farther out than our predecessors, dropping our hook in about 40 ft. of water to the sand bottom. Even with a fairly strong breeze from the east, there was still a roiling west swell. If the wind were to shift and we were suddenly on a lee shore, we wanted to leave maneuvering room to get out. The other boats were anchored in about 25 ft. in turquoise waters. It was a beautiful sight. 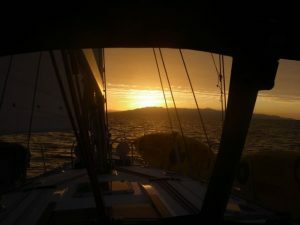 We were tucked in fairly close to Coche Point, but not so close that we couldn’t veer out 200 ft. of chain. There’s room for a dozen boats or so to have a 200 ft. radius. This just doesn’t look like a nice place to go ashore. The break was pretty ferocious and the beach is very rocky. On the other hand, the surfing looked like it would be great in the SE corner of the Bay. None that aren’t charted or visible.